Pediatric Version for under-ten. (3.1cm across). Edentulous Version for patients with dentures or missing teeth. 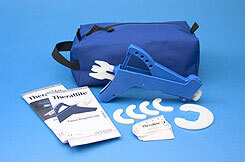 The TheraBite Rehab System is a hand operated device that provides a simple option for jaw hypomobility and dysfunction. The Therabite device successfully alleviates trismus from cancer, trauma, TMJD, facial burns, and stroke. Available in Standard, Pediatric (<10yo) and Edentulous. The TheraBite Rehabilitation System is a handheld unit designed to stretch a user's jaw to treat trismus, dysfunction and hypomobility. The device uses passive motion to stretch the user's jaw, joint and facial tissues for increased mobility, flexibility, and function. The TheraBite device provides a curved, anatomically correct stretch for patients to treat or rehabilitate their jaw and temporomandibular joint. The TheraBite system can be used for stretching, passive motion, and muscle strengthening. By utilizing the TheraBite system, a user can increase their range-of-motion, improve their jaw and joint function, and reduct swelling and pain. With continual and diligent use of the TheraBite, a typical patient can gain 1-2 mm per week in overall range of motion, with short-term gains of 1-4 mm immediately after stretching sessions. Use the TheraBite daily as directed by your doctor. Your recovery depends on your commitment to rehabilitation and is the only way to assure yourself a full, functional recovery. The TheraBite system is clinically proven as more effective than self-exercises and tongue depressors. The system is easy to use and portable, allowing patients to perform their necessary therapy while continuing in their daily life. The TheraBite has been used by thousands of patients suffering from trismus and jaw dysfunction, and may be able to help you. 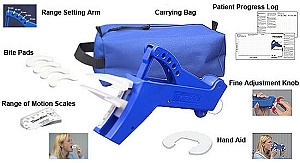 The TheraBite system includes the TheraBite device, a patient log, a hand aid, foam bite pads, and measuring scales, all easily carried in the carrying bag. The TheraBite device itself includes two controls, the range setting arm, and the fine adjustment knob, which allow the patient and doctor to control the therapy and prevent overstretching. 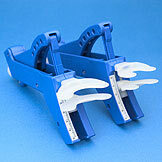 The TheraBite device mouthpieces are softened by foam pads and spread the force of the stretch across the users teeth. 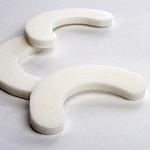 Special pads are also available for edentulous patients. The TheraBite system has been studied and successfully tested in clinical trials of post-surgical and post-radiation trismus, TMJ disorders, and traumas. 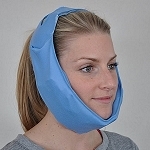 Recent studies also indicate efficacy for treatment of orofacial pain and non-surgical TMJ conditions. The TheraBite foam pads and the Range-of-Motion scales can also be purchases separately without prescription. The TheraBite system should only be used under the guidance of a medical professional. Please see the Instruction Manual for more information, warnings, and usage instructions.